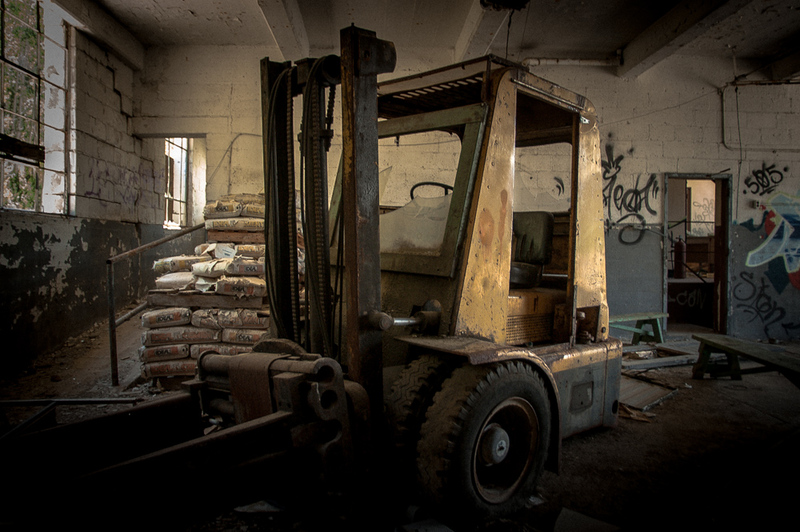 A fork lift stands where it’s operator hastily abandoned it. It’s evident from the tagging people have been to the site over the years, but the relative lack of vandalism and condition of the mine make it a rich time capsule – but for how long? The windows certainly give great light. This is another terrific shot. Tout est en chantier dans ce décor… et tu le rends beau ! Very moody shot – abandoned places make interesting themes! I have taken a look at some of the pictures you have. The abandoned mine attracts my attention. I worked at a coal mine which I had to help close down after 100+ years of operation. A mine is probably the only business that is started and will close. When mined out. The last few years are stressful as the workers know they will loose their jobs, once operations are completed. From the mine’s management side, you try to keep the mine open as long as you can, but then one day costs threaten income and the owners will pull the plug. The abandoned looks become possible. In my country we have laws requiring the owners to clean up and repair where they have mined. The owners had to keep funds aside for that purpose. So on closure you recover anything salable, fill up what can be filled, break down surface structures, clean up the messy stuff and re-plant. A lot of salvaging happens in the process. Scrap and equipment is sold, etc. In the end you drive past some 10 years later, there is nothing left and you wonder for a moment whether you are at the right place. By the way; I like your pictures. Thank you for your comment Louis, it’s good to hear a first person perspective on the industry and the experiences. Here in the States it’s also common practice close down mines in the way you mentioned. However, this mine is unique, in the early 80’s or late 70’s a contamination spill closed the mine down in literally hours, people were forced to walk out of their houses with literally only the clothes on their backs. And even all those bags of dry cement are still there??? Amazing. Nice piece of hardware here! and I just love the decay.